Over 8 out of 10 local business websites are still not mobile optimized. Seize the local opportunity by building and selling mobile websites to local businesses. Sell mobile websites and platform access to other resellers under your own brand. Build better B2B relationships and grow your network with monthly recurring revenues. See why we’re considered the easiest to use platform in the industry. Drag-and-drop modules and pre-designed templates lets you to focus your time on sales instead of technical coding. Instantly build, edit and launch mobile sites in real-time. No more building different apps for different phones; our premium mobile websites work on over 5000 devices worldwide. 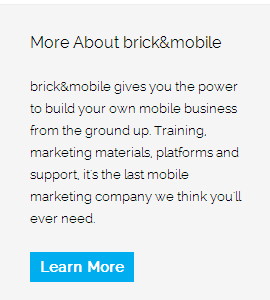 brick&mobile’s White Label Mobile CMS is a fully branded mobile website building platform. This includes access to all features, administrative access, as well as customizable support materials and premium support. Broaden your service offerings, launch your own local mobile consulting company or even build your own reseller network.